Model: B10050. Box and Papers included. I am unable to delete what it says above. Black Dial with Silver toned/Luminous Hands & index Hour Markers. Other Features: Chronograph/Stop watch functions. Double Window Large Date Displayed directly beneath the 12 o'clock position. Special Decorated Case-back has been Stamped/Embossed with the distinct shape & outline of a Bentley. Breitling Chronomat gt fully serviced in 2013 with new sapphire crystal fitted. This is a rare model as it has a 'Hunter Green' dial. Has solid Gold crown, markers and sub dials. A Fine example of a luxury watch for any collection. Pre owned Breitling Aeromarine Colt model A17380. Overall a very nice genuine Breitling. It was bought from a genuine jewellers. Case: Stainless Steel. Glass Condition: Excellent. Dial Condition: Excellent. Serviced about two months ago so it is good to go for many a year yet. Model Number: A41370. Here i have a watch for sale. See pictures. Approx 8yrs Old. Dial Color: Black. Case thickness: About 11mm. Genuine authentic Brietling headwind,day date, Case size 43.7mm without crown comes with original box no papers, Age is 2001- 2005 in great condition and keeps excellent time just serviced 2018. Please see all pictures. Men's Breitling SuperOcean A17360 Black Automatic 42mm Stainless Steel Watch. Condition is Used. Watch keeps good time and is in good condition with very few minor marks (as you'd expect from a used looked after watch). Glass is clean and scratch free with no marks. Black face. The watch does not come with any paperwork but is 100% genuine and comes in a Breitling black zip case. The strap will fit a wrist of up to approx 8 inches. The watch will be sent recorded first class. Any questions, please email. Please see other listings. Ref#B13050.1. Case Material: Stainless Steel. 80 Years of Experience. Istanbul Market was founded in Istanbul, Grand Bazaar in 1929. History Us. We are here to solve your problems. Breitling Antares Automatic Men's Watch Steel/Gold. Condition is Used. It comes with Breitling travel casing and letter to confirm authenticity which was issued by Breitling. Strap is made from genuine leather but it isn’t Breitling strap. Dispatched with Royal Mail 1st Class insures delivery. Breitling SuperOcean Steelfish XL. This SuperOcean Steelfish is in excellent condition all round. It is a 2008 watch so benefits from the later design of second hand (b eing arrow headed rather than the earlier dot style) and also the later design of inner/outer box. StunningBreitling Serie Speciale Chronomat Automatic Watch,Model 81950, With New Gold And. Silver Colour Bracelet, Blue Dial With Date Window. Swiss Made, With An 18K Gold Bezel. Model number A17380. BREITLING COLT AUTOMATIC. 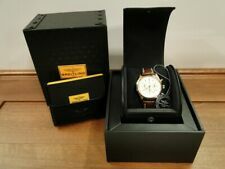 BOX/ 2005 YR. supplied with ITS BREITLING BOX /1 YEAR WARRANTY. 1 YR WARRANTY. AUTOMATIC 41MM. 12 MONTH WARRANTY PRESTIGE WATCHES. SUPPLIED WITH A 12 MONTH PRESTIGE WARRANTY. A13356 AUTOMATIC. BREITLING CHRONOMAT. BREITLING CHRONOMAT AUTOMATIC. Model number A13356. 1 YR WARRANTY. 12 MONTH WARRANTY PRESTIGE WATCHES. SUPPLIED WITH A 12 MONTH PRESTIGE WARRANTY. The pictures you see on our website are of the actual watch you are buying. A Breitling rubber dive strap with Titanium buckle. A quality nut brown padded two-piece leather strap with Breitling buckle. International warranty card /booklet blank & Avenger instruction manual. Model Number: A78362. 1 Year Warranty. Strap Material: Leather. Strap Length: N/A - adjustable buckle. Lug Width: 22mm. Case Material: Stainless steel. Case Width: 42mm. Condition Detail: Watch is in mint condition. BREITLING SUPEROCEAN. BREITLING SUPEROCEAN AUTOMATIC. GENERIC BOX/MANUAL/ 2002 YR. 1 YR WARRANTY. AUTOMATIC 40MM. GENERIC BOX/MANUAL/WARRANTY., GENERIC BOX/MANUAL/WARRANTY. 12 MONTH WARRANTY PRESTIGE WATCHES. Breitling Super Avenger II A13371 Blue Baton Dial - Box & Papers. Condition is Used. 2 links missing that were removed upon purchasing. Dispatched with DPD Tracked Next Day Service. Stainless Steel Sports Watch A17340. Breitling Superocean 42mm Automatic. The Superocean defines the classic dive watch. This item is pre owned, the watch itself is in good condition, there are signs of gentle wear. For sale nice used Breitling Hercules black in good condition.Rare 45mm watch.100% genuine original watch. The service paperwork for this (dated: 17/04/2018) will be provided with the watch. MODELSUPER AVENGER. AGE10TH SEPTEMBER 2003. OUR WARRANTY12 MONTHS. (We can have the watch checked and tested for you in advance, and if required re-sealed approx. Upon request, we are happy to arrange viewing with local authorized watchmaker or reputable Swiss watch maker in central - London to confirm the authenticity of any of our watches which you might be interested in. ). Model number A17392. BREITLING SUPEROCEAN II CHRONOGRAPH. BREITLING SUPEROCEAN 2 AUTOMATIC. BOX/PAPERS/ 2016 YR. supplied with ITS BREITLING BOX SET/PAPERS. 1 YR WARRANTY. AUTOMATIC 44MM. - With Box & Papers?. Model number A17350. BREITLING SUPEROCEAN. BREITLING SUPEROCEAN AUTOMATIC. BOX/WARRANTY/ 1999 YR. supplied with ITS BREITLING BOX SET/WARRANTY. 1 YR WARRANTY. 12 MONTH WARRANTY PRESTIGE WATCHES. SUPPLIED WITH A 12 MONTH PRESTIGE WARRANTY. Model number A17360 STEELFISH. BREITLING SUPEROCEAN STEELFISH. BREITLING SUPEROCEAN STEELFISH AUTOMATIC. BOX/PAPERS/ 2006 YR. supplied with ITS BREITLING BOX SET/MANUAL/PAPERS. 1 YR WARRANTY. - With Box & Papers?. Model number A3733012. BREITLING GALACTIC UNISEX. BREITLING GALACTIC. supplied with ITS BREITLING BOX /PAPERS/1 YEAR WARRANTY. 1 YR WARRANTY. SMALLER CASE WATCH. - With Box & Papers?. UNISEX WATCH. Breitling Avenger Seawolf. Watch is running. Stainless steel case & bracelet. Year: 2015. Our team will respond asap to get things sorted for you ?. All jewellery & watches are Pre-Owned unless stated otherwise and condition should be considered as such. USED 1960'S BREITLING BLACK DIAL . STRAP : Black leather strap but not original Breitling. DIAL : Black dial ( Professional redial ). MAN'S WATCH. CONDITION : Watch it's in nice condition for it's age as you can see at the Photos,working condition. Model Number: A13352. Case Size: 39mm. We deal in the finest high quality new and pre-owned watches made byA. Watch Details. Watch Features. Watch Item. Warranty: 12 Month Warranty. Bezel: Stainless Steel. A20348 AUTOMATIC. Model number A20348. BREITLING CHRONOMAT LONGITUDE. BREITLING CHRONOMAT LONGITUDE AUTOMATIC. 1 YR WARRANTY. - With Box & Papers?. 12 MONTH WARRANTY PRESTIGE WATCHES. SUPPLIED WITH A 12 MONTH PRESTIGE WARRANTY. Model No:A13035 - plus serial number (partly hidden in photo for security). 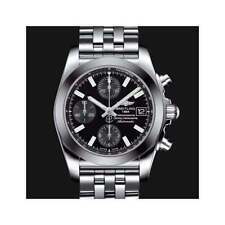 Breitling Colt Chrono. Includes:Breitling service box and Instruction booklet and our Certificate of Authenticity. Stainless steel pushers and screw down crown with Breitling "B". BREITLING Superocean 44. Strap - BREITLING Stainless Steel bracelet with folding clasp. Full size and factory sealed. Boxes, booklets, COSC Certificate, warranty card & papers. Case Thicknes - 13.5 MM. Supplied with ITS BOX AND ITS BREITLING PAPERS. 1 YR WARRANTY. - With Box & Papers?. 12 MONTH WARRANTY PRESTIGE WATCHES. SUPPLIED WITH A 12 MONTH PRESTIGE WARRANTY. With Box & Papers?. Complete with BOX/ PAPERS /MANUAL AND WARRANTY. Breitling leather strap: original with breitling buckle. Reference: 1806. Functions: hours, minutes, seconds, Chronograph. Case: oversized stainless steel. Buttons: a pump. Breitling Super Avenger. Lovely condition fully serviced. Beautiful condition. 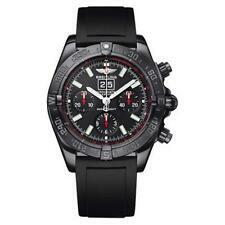 Breitling Super Avenger. Lovely condition fully serviced. Beautiful condition.. Condition is used but looks great. Serviced prior to my purchase of the watch. If you wish to collect this is fine, but, this would be cash only. Will be sent Royal Mail signed and insured. Model number A32350. BREITLING COLT GMT. 1 YR WARRANTY. - With Box & Papers?. 12 MONTH WARRANTY PRESTIGE WATCHES. SUPPLIED WITH A 12 MONTH PRESTIGE WARRANTY. BOX/PAPERS/1 YEAR WARRANTY. With Box & Papers?. BREITLING CHRONOMAT 44 BLACK ONYX DIAL ORIGINAL STAINLESS STEEL PILOT BRACELET ORIGINAL BLACK ALLIGATOR STRAP WITH WHITE STITCHING AND FOLDING CLASP BOX AND PAPERS (TAGS,GUARANTEE AND CERT) 2 YEAR WARRANTY REMAINING FROM BREITLING TRAVEL CASE PURCHASED IN 2015 ONLY WORN FROM 2016 AS IT WAS A GIFT GOOD CONDITION, WELL LOOKED AFTER BY A WATCH ENTHUSIAST! ANY QUESTIONS OR EXTRA PICS PLEASE CONTACT. Select a breitling mechanical movement adult watch for maximum ease of use. These watches are very low-maintenance for added convenience. The second hands rotate in a sweeping motion, moving continuously around the dial. Featuring a traditional band, genuine leather band watches are staple pieces for any jewellery collection. The genuine leather bands are soft, ensuring a comfortable feel against your skin. Platinum band wristwatches are designed from very strong materials for added durability. Made from hypoallergenic materials, they will be a great fit for those with allergies to certain metals. Binary wristwatches display the time in a bar graph with ones and zeros. They are typically designed with backlighting, so you can easily read the time in poor lighting conditions. LED wristwatches show the time digitally, so they are very easy to read. Typically built with a quartz crystal and a tiny digital computer in order to keep track of the time, they deliver enhanced accuracy.